Description: This is a automatics 30" steering column without key. Raw Stainless Steel . It is without ignition switch in the column, 2" Column diameter, 1" DD Output shaft, with shift indicator. This is a universal column. It has no specific application. It comes with a 9 holes style steering wheel adapter which. Fit for huge aftermarket wheels and even some factory.GM ones. You can use different adapters depending on the style of wheel you have. It is easy to change and readily available. 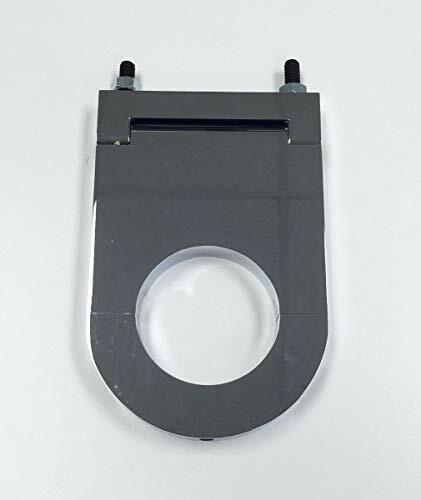 Polished Aluminum Swivel Floor Mount 1-3/4" Steering Columns Hot Rat Street RodFits 1.75" outer diameter steering columns that are popular in the after market. 60 degree removable with 2 part outer trim ring. Mounting hardware included. 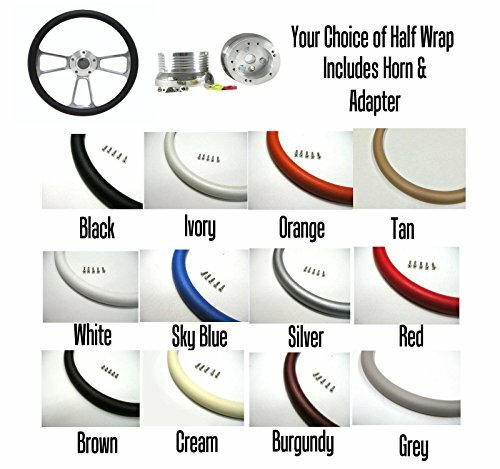 Works great with GM (Chevy, GMC, Pontiac, Cadillac, Buick, Oldsmobile), Ford and Mopar (Chrysler, Dodge, Plymouth), Hot Rods, Rat Rods, Street Rods, Customs and more!Details:Swivel Design allows 60 of angle while maintaining proper mounting 1-3/4" Diameter found in the most popular Aftermarket Columns Universal Fit Outer trim ring is split in 2 halves. Works great with GM (Chevy, GMC, Pontiac, Cadillac, Buick, Oldsmobile), Ford and MOPAR (Chrysler, Dodge, Plymouth), Hot Rods, Rat Rods, Street Rods, Customs and more! 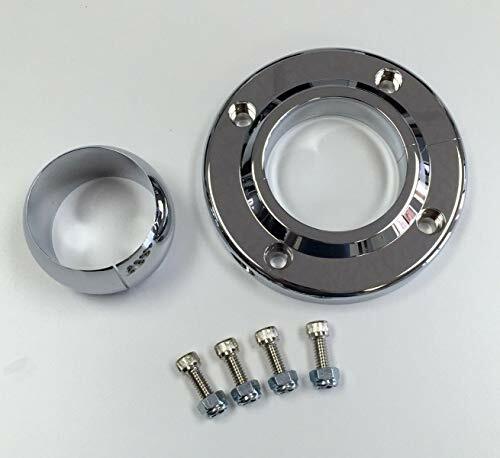 Brand New Chrome Aluminum 3-1/2 inch Column Drop for 2 Inch diameter Steering columns. Universal design with a swivel style mount, mounting bolts, and easy to mount split ring design. 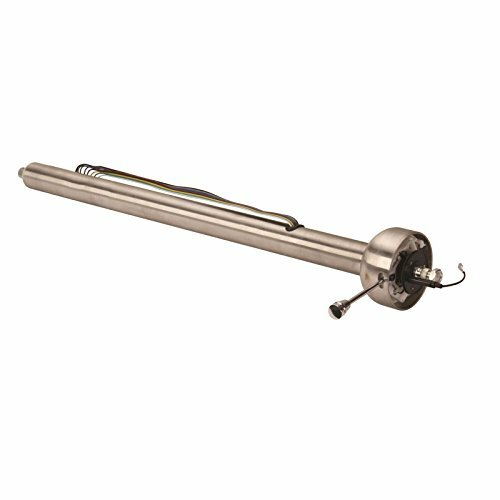 This column drop is actually two piece and by removing the two screws in the bottom it allows easy installation around your column. This is a brand new chrome plated billet aluminum steering wheel package. 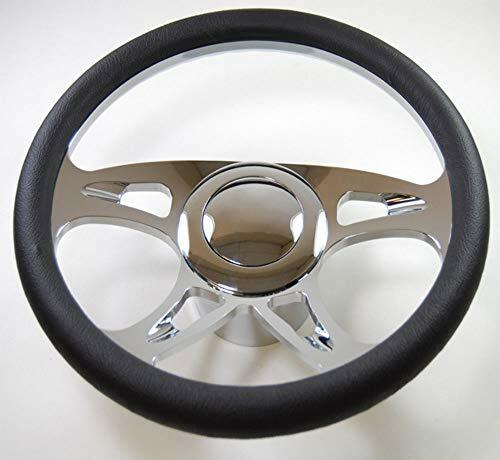 The steering wheel is CNC machined from billet aluminum then polished and chrome plated. These steering wheels are 14 inch diameter with a 2 inch depth dish. These wheels are half wrapped in black leather. 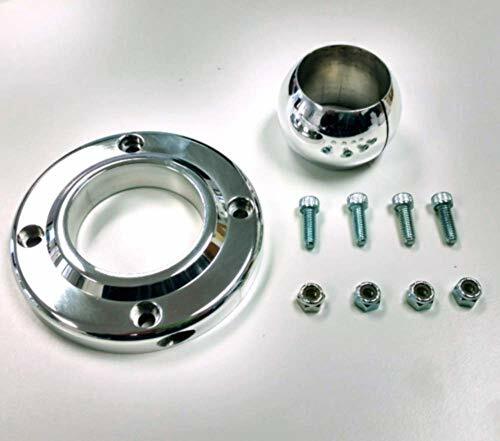 This kit includes the chrome plated billet aluminum horn button and steering wheel adapter. This kit is designed to fit most 1967-94 GM columns. Brand New Chrome Aluminum 4-1/2 inch Column Drop for 2 Inch diameter Steering columns. Universal design with a swivel style mount, mounting bolts, and easy to mount split ring design. This column drop is actually two piece and by removing the two screws in the bottom it allows easy installation around your column. Our original Hot Rod Steering Column has been a huge success, but many rodders said they wanted one with a turn signal.The Nostalgia Columns offer a similar vintage look but have modern GM-style turn signal, hazard light and horn functions built into the attractive bell-shaped upper housings.Perfect for a wide variety of 1920's through 1950's era rods, as well as Cobras and other kit cars.The columns measure 30" long and have 3/4"-36 spline lower shafts. 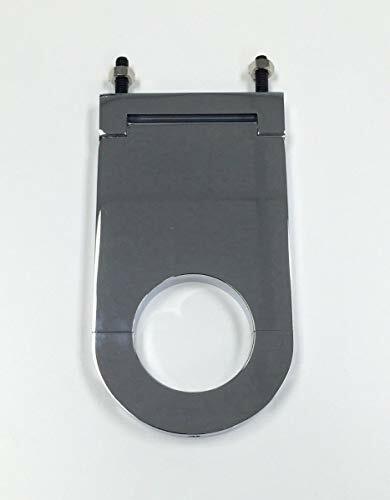 They're available with paintable stainless steel housings. 30" long Beautiful Art-Deco styling Paintable Stainless steel Turn signal, hazard light and horn functions Note: This column will not work with Speedway 9 bolt steering wheel adapters. This column will work Grant adapter 410-3196. Chevy Hot Rod 15" Mahogany Banjo Steering Wheel with Stainless Steel Spokes "
Want more Hot Rod Steering similar ideas? Try to explore these searches: Damascus African Ebony Wood Handle, Baby Shower Lollipop Molds, and Co2 Generator Natural.